Telugu Titans thrashed Haryana Steelers 37-19 to record a much-needed victory in the Inter Zone Challenge Week of Vivo Pro Kabaddi League. Rahul Chaudhari scored 09 points as Titans won their fourth match of the season. Vishal Bhardwaj led the Titans defence superbly and scored six points to contain Haryana Steelers' raiders. Wazir Singh was the only bright light for Haryana Steelers as most of their players struggled to get points on the board. Telugu Titans now have 29 points from 14 games but remain fifth in Zone B. Haryana Steelers are second in Zone A with 41 points from 13 games. Haryana Steelers scored their first point in the third minute as they trailed 1-3. Telugu Titans were the better team in the first eight minutes as they led 5-2. Haryana Steelers raiders couldn't score a single point in nine minutes as they trailed 2-6. Telugu Titans led 7-4 after 13 minutes as Rahul Chaudhari couldn't get into the raiding act for them. Nilesh Salunke forced Haryana defence to make an error and scored two points as Telugu Titans led 9-6 after 15 minutes. Wazir Singh scored a raid point for Haryana Steelers as they trailed 8-11 in the 19th minute. 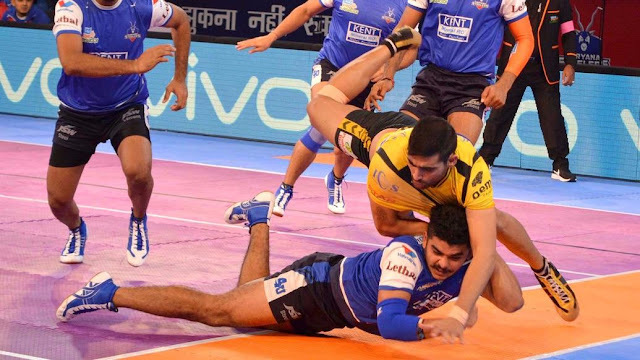 Rahul Chaudhari scored his third point of the match as Telugu Titans went into the break leading 12-8. Haryana Steelers forced a super tackle in the 23rd minute as they trailed 10-12. Nilesh Salunke scored three raid points in two minutes as Telugu Titans inflicted an all out to lead 18-11 in the 25th minute. Telugu Titans kept the pressure on Haryana Steelers by picking up raid and tackle points in the next few minutes to lead 23-15 after 31 minutes. Rahul Chaudhari scored another raid point in the 34th minute as Telugu Titans led 27-15. Telugu Titans inflicted an all out in the 35th minute to lead 32-16. Rahul Chaudhari scored another raid point as Telugu Titans led 35-17 after 37 minutes. Telugu Titans were in desperate need of a win and their players delivered as they won 37-19 to pick important points.